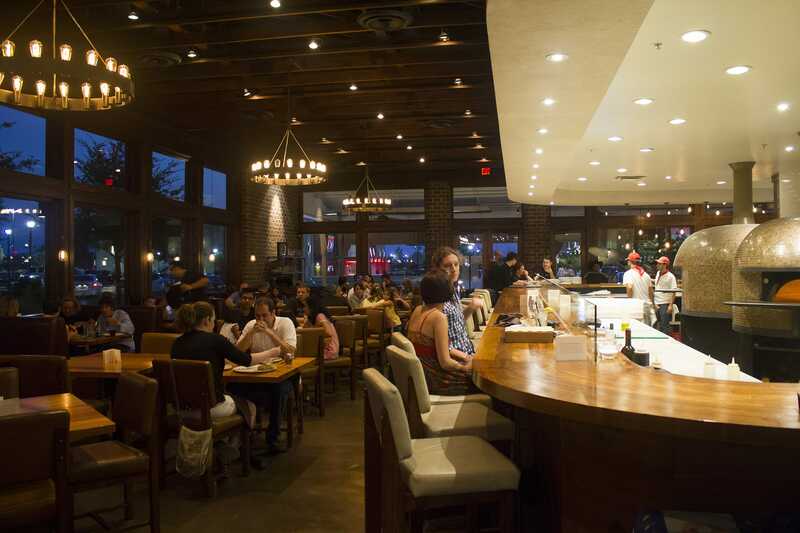 As Frisco has continued its rapid growth, the number of dining options across every imaginable category has expanded accordingly. One food most of us will agree is pure greatness is pizza. Sure, some of us might prefer New York style, where the huge slices can be folded in half and eaten with your hands, while others might opt for Chicago style deep dish, preferring to eat their pizza with a knife and fork. No matter which style of pizza you prefer, there are some great spots in our fair ‘burb. Here’s a quick look at seven such spots, listed in alphabetical order. Many consider this growing local chain, which has since expanded into both Austin and Houston, as the best pizza in the entire Metroplex, and that’s a point which is hard to argue. The Cane Rosso here in Frisco scores major points for having its pizza oven shaped like a football helmet… After all, it’s located at the Cowboys’ incomparable World Headquarters complex, The Star in Frisco. Cane Rosso also has several Cowboys-themed items on the menu, Frisco exclusives if you will — the Jimmy Johnson Dip, named after the iconic former coach of America’s Team, and The Star pizza, which is billed on their website as “the lovechild between a pizza and a calzone,” shaped like a star and featuring ricotta, mozzarella, heirloom tomatoes, pepperoni, and arugula. Of course, there are other standards to expect from Cane Rosso, like the Gus, their sausage and mushroom pizza, which remains one of their most popular pies. The Margherita is another simple yet tasty choice. Cane Rosso also offers wings, meatballs, sandwiches, and a fried calzone. An “Austin style” wine bar in historic downtown Frisco, eight | 11 is one of the many renovated historic homes-turned-businesses in The Rail District, and offers a rotating collection of wines, locally brewed beers, and a full menu of shareables, salads, paninis and desserts, in addition to some amazing Artisan Style pizzas. Many people say their Artisan-style pizza is the hands-down the best in Frisco, with really unique flavors like the Pineapple Pig, and Pesto Chicken. A favorite is the Prosciutto pizza, which features prosciutto and fig jam, topped with arugula, goat cheese, and balsamic glaze. The “Godfather” features prosciutto, salami, pepperoni, truffle oil, banana peppers, fresh rosemary and mozzarella cheese. Michael Durkin started his flourishing mini-chain in 2008 in McKinney. Several years back, he expanded into Frisco with a location just north of Toyota Stadium. Durkin’s offers great pizzas, including various lunch specials, meatball subs and calzones along with lasagna and spaghetti. Other than their pizza, the most unique thing on their menu might be the Pizza Topping Sandwich (PTS), where diners can choose which toppings they want on their sandwich, sort of a hybrid between a pizza and a calzone. Durkin’s website promises pizza, beer, wine and rock-and-roll, a winning combination to say the least. There are literally Joe’s Pizzas all over DFW, but for the past decade, this one has been across from what is now the Star in Frisco back when it was still an empty swath of land. Our local Joe’s offers plenty of great lunch specials, including a slice or two of pizza, a small salad and a drink. Joe’s also scores points for offering a huge variety of pizza, including New York style, Chicago style deep dish and white pizza, which has no sauce. Other offerings include panini, pasta, sandwiches, calzone and stromboli, making Joe’s another great spot serving up something for every taste. Luigi’s is one of the older spots on this list, having been in town for well over a decade at the northeast corner of Preston Road and Lebanon. They proudly offer New York Style pizza, which has been rightfully lauded as the best in Frisco. Luigi’s sells pizza by the slice for lunch and entire pies all day. But they also score points for their entire menu, which features appetizers like fried mozzarella, mushrooms, ravioli and zucchini, a full line of sandwiches, calzone and stromboli. Besides serving up tasty pizza, Luigi’s also delivers delicious pasta, including such standbys as fettuccini alfredo and spaghetti and meatballs. This popular Frisco Square spot dishes out some of the best pizza in town, Neapolitan style of course. They are as well-known for their authentic Italian pizza as they are for the twin 7,000 lb. ovens handmade in Italy by Stefano Ferraro. The impressive ovens are the centerpiece of the food preparation and atmosphere. Pizzeria Testa has several lunch specials, including smaller versions of their popular pies while also offering both red and white pizza and calzones. Some of the most popular pies here are the Margherita, Quattro Formaggi (four-cheese) and Salsiccia (sausage). Pizzeria Testa also scores points for being the only local pizzeria serving up its namesake by the meter (or 3.28 feet for those who don’t follow the metric system). The Meter-Long Pizza is a cool way to share a pie with family or friends. 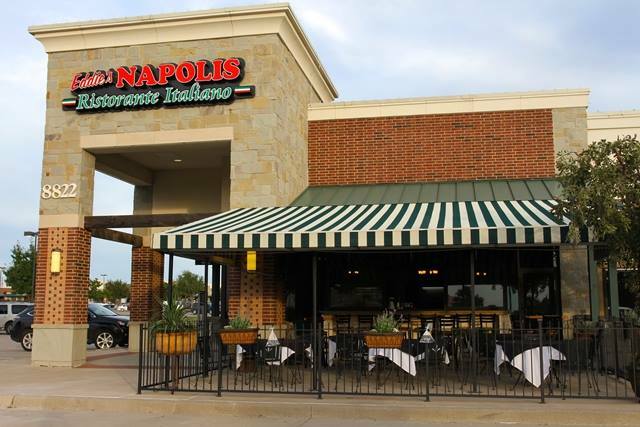 Some call it “unpretentiously upscale.” Others might dub it “casual elegance.” Whichever adjectives you prefer, the family-owned Eddie’s Napolis has been serving up good food and good times to Frisco residents for five years. This inviting neighborhood restaurant offers a wide variety of authentic Italian dishes, complemented by a nice wine list, live music and a full bar. The extensive menu includes homemade pastas as well as specialty pizzas. While they offer standard favorites like Margherita and Hawaiian, they have unique options as well like the Four Season pizza, featuring artichokes, roasted red peppers, mushrooms and fresh eggplant. Another specialty pie is the Seafood pizza featuring olive oil, shrimp and crab meat, clams and mozzarella.